➡ 1:30 pm- 3:00 pm: Arrival, Lunch, Solat. We have been receiving a lot of calls asking about what After School Tahfiz is all about. The best way to explain is to tell you what our little khalifahs do from the time the program starts at 1:30pm till it ends at 6:00pm. Before that, let us share with you who this program is for. The After School Tahfiz program is for schooling children from the age of 7 years old (Primary 1) to 12 years old (Primary 6) from secular primary schools or madrasah. We do provide transport with additional charges to the provider. Lunch and tea-break is provided daily in the program when the little khalifahs check in at 1:30pm they will have their lunch, take a short shower and change their clothes. They will then perform Zuhur together at 3:00pm. Every little khalifahs must start doing their homework, or revision and spelling if they have finished their work in school. They have one hour to do so. If they can’t finish their homework by 4:00pm they need to complete it with their parents at home. At 4:oopm our little khalifahs will start doing their Quran memorization and learn to read the Quran. Those who joined daily from January this year have managed to memorized 30 surahs by September. 4:45pm-5:15 is their time for tea-break perform Solat ‘Asar together. 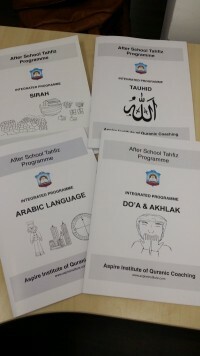 At 5:15pm they will have their Integrated Islamic Program which includes Sirah, Tauhid, Arabic, Doa&Akhlak. Each subject is delivered once weekly, different subject everyday. 6:00pm is Home Sweet Home. Our little khalifahs are ready to be fetched by 6:00. The campus closes at 6:30pm. 1:30 pm – 3:00 pm: Arrival, Lunch, Solat. Last Updated: 06:47pm, 5 Dec 2018. ✒ The objective of this program is so that our schooling children in secular (or madrasah) primary school get a conducive environment for them to pray zuhur together, pray ‘asar together, learn to read and memorize the Quran together, learn Islam together and do their homework together everyday, or twice a week between 1:30pm-6:30pm, so that parents are at peace when they at work knowing that their Little Khalifahs are having balanced exposure of Islamic education and secular education. We are blessed to present to you Aspire Institute’s “After School Tahfiz Program for Our Little Khalifahs. 1- Read and understand ENGLISH. 2- Age group 7-12 years old. The curriculum of the program is designed specifically for schooling children in Singapore who are comfortable in English, and love to learn the Quran and its language in a joyful setting free of stress, but at the same time properly structured and objective oriented. QURAN / INTRO TO QURAN (ALIF BA’ TA’)! Our Little Khalifahs will learn the subjects outdoor and indoor for 3 hours everyday. And they will learn the foundation of practicing Islam from young and enthusiastic Madrasah graduates! Little Khalifahs will be grouped to those who can read the Quran and those will start learning from Alif Ba’ Ta’. Total of only $300 monthly for 100hrs of fun learning about Islam and Quran every month. Payment of $50 registration fee doesn’t include first month fee and material fee of $80 (half-yearly). Your child’s place will only be secured and registration is confirmed once registration fee is successfully transferred.